If you would like to be filled with despair for the prospects of democracy, spend a few minutes attempting to decipher the psephological musings of Lena Dunham, the distinctly unappealing actress commissioned by Planned Parenthood to share with her presumably illiterate following “5 Reasons Why I Vote (and You Should, Too).” That’s 21st-century U.S. politics in miniature: a half-assed listicle penned by a half-bright celebrity and published by a gang of abortion profiteers. It is an excellent fit, if you think about it: Our national commitment to permanent, asinine, incontinent juvenility, which results in, among other things, a million or so abortions a year, is not entirely unrelated to the cultural debasement that is the only possible explanation for the career of Lena Dunham. A people mature enough to manage the relationship between procreative input and procreative output without recourse to the surgical dismemberment of living human organisms probably would not find much of interest in the work of Miss Dunham. But we are a nation of adult children so horrified by the prospect of actual children that we put one in five of them to death for such excellent reasons as the desire to fit nicely into a prom dress. It’s not for nothing that, on the precipice of 30, Miss Dunham is famous for a television series called Girls rather than one called Women. She might have gone one better and called it Thumbsuckers. (The more appropriate title Diapers would terrify her demographic.) Miss Dunham, reflecting celebrity culture at large, makes a fetish of voting, and it is easy to see why: Voting is the most shallow gesture of citizenship there is, the issuance of a demand — a statement that “this is how the world should be,” as Miss Dunham puts it — imposing nothing in the way of reciprocal responsibility. I would like to suggest, as gently as I can, that if you are voting as an act of self-gratification, if you do not understand the role that voting in fact plays in a constitutional republic, and if you need Lena Dunham to tell you why and how you should be voting — you should not vote. If you get your politics from actors and your news from television comedians — you should not vote. The encouragement of patriotism is no longer a part of our public educational system, and the cost of that omission has made itself felt. This would have alarmed and dismayed the founders of our country. Jefferson meant American education to produce a necessary patriotism. Democracy—of all political systems, because it depends on the participation of its citizens in their own government and because it depends on their own free will to risk their lives in its defense—stands in the greatest need of an education that produces patriotism…Our schools have retreated from the idea of moral education, except for some attempts at what is called “values clarification,” which is generally a cloak for moral relativism verging on nihilism of the sort that asserts that whatever feels good is good…Even more vigorously have the schools fled from the idea of encouraging patriotism. In the intellectual climate of our time, the very suggestion brings contemptuous sneers or outrage, depending on the listener’s mood. That does not require us to denigrate or attack any other country, nor does it require us to admire our own uncritically. But just as an individual must have an appropriate love of himself if he is to perform well, an appropriate love of his family if he and it are to prosper, so, too, must he love his country if it is to survive. Neither family nor nation can flourish without love, support and defense, so that an individual who has benefited from those institutions not only serves his self-interest but also has a moral responsibility to give them his support. Thus are assaults on patriotism failures of character. They are made by privileged people who enjoy the full benefits offered by the country they deride and detest, but they lack the basic decency to pay it the allegiance and respect that honor demands. But honor, of course, is also an object of their derision. Every country requires a high degree of cooperation and unity among its citizens if it is to achieve the internal harmony that every good society requires. Most countries have relied on the common ancestry and traditions of their people as the basis of their unity, but the United States can rely on no such commonality. We are an enormously diverse and varied people, almost all immigrants or the descendants of immigrants. The great strengths provided by this diversity are matched by great dangers. We are always vulnerable to divisions among us that can be exploited to set one group against another and destroy the unity and harmony that have allowed us to flourish. We live in a time when civic devotion has been undermined and national unity is under attack. The idea of a common American culture, enriched by the diverse elements that compose it but available equally to all, is under assault, and attempts are made to replace it with narrower and politically divisive programs that are certain to set one group of Americans against another. The story of this country’s vision of a free, democratic republic and of its struggle to achieve it need not fear the most thorough examination and can proudly stand comparison with that of any other land. In the long and deadly battle against those who hate Western ideals, and hate America in particular, we must be powerfully armed, morally as well as materially. To sustain us through the worst times we need courage and unity, and these must rest on a justified and informed patriotism. Great article on how The Shawshank Redemption became one of the most beloved films of all time. I can’t pick just one part to excerpt, so if you’re a Shawshank fan, go read it. Twice in the last few months I’ve encountered writers taking note of this shift, and both have made a similar (and provocative) point: The decline of cults, while good news for anxious parents of potential devotees, might actually be a worrying sign for Western culture, an indicator not only of religious stagnation but of declining creativity writ large. The first writer is Philip Jenkins, a prolific religious historian, who argues that the decline in “the number and scale of controversial fringe sects” is both “genuine and epochal,” and something that should worry more mainstream religious believers rather than comfort them. A wild fringe, he suggests, is often a sign of a healthy, vital center, and a religious culture that lacks for charismatic weirdos may lack “a solid core of spiritual activism and inquiry” as well. Perhaps the sacrifice is worth it, and a little intellectual stagnation is a reasonable price to pay for fewer cults and Communists. Or maybe the quest for secrets — material or metaphysical, undiscovered or too-long forgotten — is worth a little extra risk. Tyson’s concession is better late than never, to be sure, but the issue is how long it took to get even a promise of a future admission on this issue—and not just from Tyson himself, but from his legions of supporters. That he misquoted Bush is not so important. People misquote other people all the time. What is important is Tyson’s initial dismissive attitude and his online supporters’ refusal to admit that the great man could make an error. So we were treated to a host of rationalizations from Tyson’s supporters. We saw media types whose professional responsibilities presumably include verifying quotations from public figures, who threw up their hands and declared that in this case, accuracy didn’t matter. Then there was the deletion of any mention of the controversy on Wikipedia, followed by a retaliatory attempt to scrub the very existence of The Federalist from the online encyclopedia. So why does all this circling of the wagons matter? It matters because these are the same people claiming special credibility, as self-appointed tribunes of science, on issues that are much, much larger. No, Tyson misquoting Bush does not directly imply that global warming isn’t happening. (And no, John Aziz, no one ever claimed that it did.) But when the whole public case for global warming is based on a supposed consensus among climate scientists, whose judgment we are supposed to trust, then we need to know: could these scientists and their public advocates actually admit it if they were wrong? If some new evidence—say, increasing Antarctic ice, or a 17-year plateau in surface temperatures—contradicted their theory, how eager would they be to own up to it? In that context, it is precisely the relative unimportance of the Tyson examples that makes them so worrying. If a correction has to be pulled out so unwillingly on such a small issue, and if so many people are willing to tolerate a little factual inaccuracy so long as they agree with the overall narrative, that only gives you a flavor for how unwilling they are to budge on the bigger issues. I mention global warming as an example, but it’s broader than that. Cass Sunstein has popularized the idea of regulatory “nudging,” all based on the presumption that cognitive scientists and academic elites know better how we should run our lives. Left to our own devices, we will mess up most of our decisions, so they have to manipulate our “choice architecture” to steer us in the right direction. They’re all convinced that we poor souls suffer from “cognitive bias” that clouds our thinking—Confirmation Bias, say, or In-Group Bias—but they are free from such biases. Call this Cognitive Bias Bias. This is all summed up in a classic Neil deGrasse Tyson aphorism which, judging from his Twitter feed, is extremely popular: “If your belief system is not founded in an objective reality, you should not be making decisions that affect other people.” When you really think about this, the upshot is that no one who is religious is entitled to make decisions, not even about his own life—after all, what decision does not, in some small way, “affect other people”? By contrast, those who agree with Tyson assure themselves that because their belief system is “based on objective fact,” they are entitled to make decisions for other people, such as reorganizing the entire health-care system or dismantling the global economy to stop global warming. All of which inspired me to tweet in response: “What if your belief that your belief system is based on an objective reality is not based on an objective reality?” In this case, Tyson held a belief that was not founded in an objective reality. And it took a revealingly long time to get anyone to acknowledge that. Our fan girl media, everyone. Do they ever feel embarrassed when they do stuff like this? 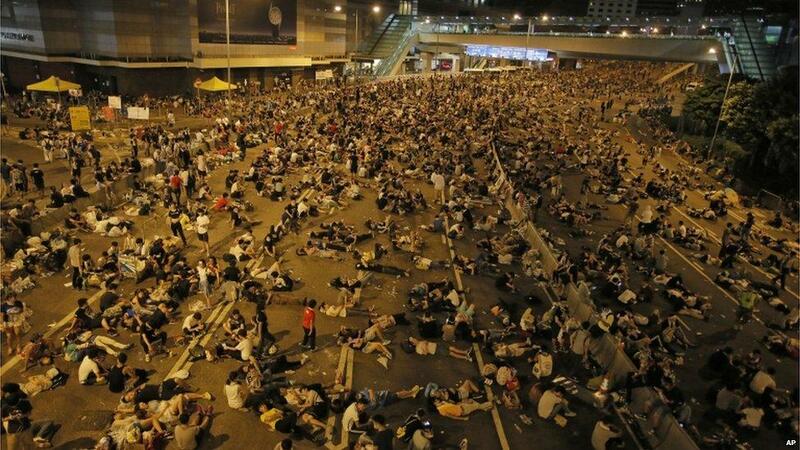 Pro-democracy demonstrators sleep on the streets of Hong Kong after angry protests against China over the weekend. Tom Rogan explains. Photo by AP. One of the most horrifying yet somehow miraculously non-fatal shootings you’ll ever see. A cop pulls into a gas station, casually asks to see the license of a man who’s parked in front of him, and then when the driver turns back towards the front seat to get it, the cop … freaks out and fires three shots from maybe six feet away. The driver, Levar Jones, was hit at least once in the hip and taken to the hospital. The reason the cop wanted to see his license, incidentally, was because Jones wasn’t wearing his seatbelt. The cop, Sean Groubert, told the DA afterward that Jones was behaving aggressively. The DA took that statement, then took a look at this dashcam video. Result: Groubert’s been charged with assault and battery of a high and aggravated nature, a felony that could land him 20 years in prison. He was fired from the state highway patrol on Friday. The video is obviously disturbing, and also casts a lot of doubt on the police version of events. The police have said they shot Crawford only after repeated demands that he drop the rifle. The video strongly suggests that they shot him almost immediately after encountering him. The video also doesn’t show Crawford pointing the gun at anyone. Witness Ronald Ritchie told a 911 dispatcher that Crawford was pointing the gun at children, a claim he repeated to the media. Earlier this month Ritchie changed his story, apparently after viewing the surveillance video above. More importantly, the video makes clear that Crawford never pointed the gun at police, and strongly suggests they never gave him an opportunity to drop it…There are some obvious questions here about police training, most importantly why they fired so quickly and made no attempt at de-escalation. If they had, it seems pretty clear that Crawford would have dropped the gun and would still be alive today. It’s hard to believe that a father of two knowingly provoked police with a pellet rifle. It isn’t difficult to see how the misconception that mass shootings are becoming ubiquitous might make us see threats and potential mass killers instead of, say, a guy checking out a pellet gun, or a Costco shopper with a legal sidearm. And it isn’t difficult to see how a frightened witness might even exaggerate what he saw to get the police to take him seriously. The media has been doing what they do this week: irresponsibly misreporting. Jesse Walker breaks down a new FBI report that the media has interpreted as saying “mass shootings are on the rise,” even though the data says no such thing. 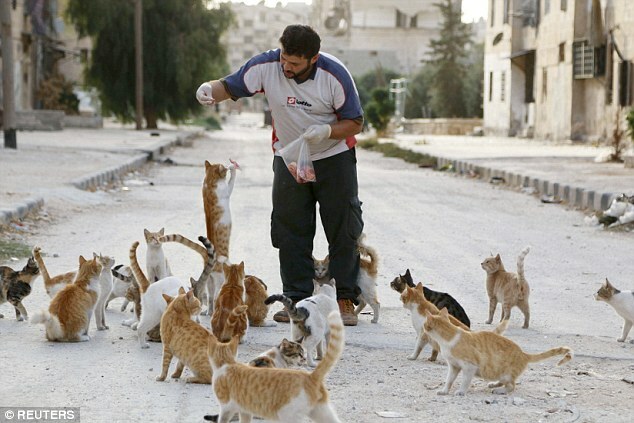 Meet the Syrian ambulance driver who is spending his savings feeding the abandoned pet cats of Aleppo. What a nice thing to do.